The Fournier Trio were formed in 2009 while studying at the Royal Academy of Music. They have won a number of competition prizes and have toured widely across the UK and Europe. They have premiered a number of new works, including a trio by Hugh Wood. This is their first recording, a second featuring the Mendelssohn trios on the Resonus label is due out later this year. To choose the Ravel trio as part of your first recording is courageous, as Sir Humphrey might have said. It joins more than sixty currently available recordings, and everyone will have their established favourites. Mine is the Florestan Trio on Hyperion, which also has the Fauré as disc-mate. Thus the bar is set very high for the Fournier Trio, and to their credit, it is very well played. It is a very restrained, almost repressed reading, and I found myself wishing at times for more passion. 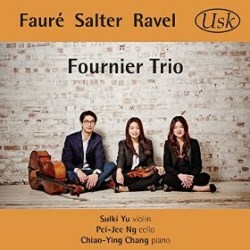 The Fauré trio was his penultimate published work, and more elusive than his earlier piano quartets, which for me, are among the greatest chamber music ever written. The competition here is not quite as fierce as that for the Ravel, but again the Florestan Trio is a benchmark. The Fournier Trio is significantly slower in each movement; again, that word “restrained” comes to mind. Here it is not to their advantage, as it causes the work to meander somewhat. As with the Ravel, the quality of the playing, and the sound that each member of the trio produces cannot be faulted. The curiosity on this CD is obviously the work by Timothy Salter. He was musically educated at Cambridge, taught at the Royal College of Music and founded the Usk label in 1995. A number of recordings of his music have been reviewed on this site (see here). This was my first exposure to his music, and in all honesty, I can’t say that I will rush to order the others. The first movement – marked Agitated – is very much as it says on the label, jerking from one idea to the next without obvious connection. I may not have felt agitated by the end, but it did cause my cat to leave the room. The remaining movements – Elegiac and Graceful, playful – are somewhat better, but still lack much in the way of a melody. I guess that statement identifies me as a “stick-in-the-mud” traditionalist, and probably unsuitable to pass comment on a work such as this. That being so, the CD is available on iTunes, and thus it is possible to sample the work to determine whether you are more responsive to it than I was. The sound quality is excellent, and the notes, written by Timothy Salter, provide detailed analysis of the music, in a way that doesn’t baffle the untrained reader. Even so, I do wonder at the wisdom of this release. Those drawn to the Ravel and Fauré may be turned off by the Salter, as I was. Those interested in contemporary works may wish that the whole CD was cut from the same cloth.